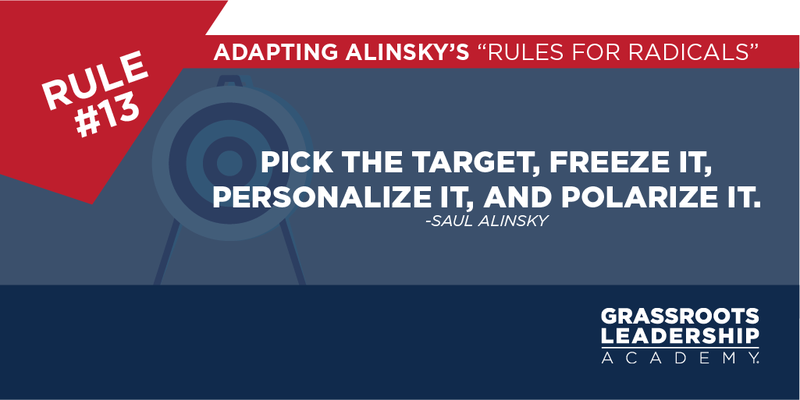 Alinsky’s Rule for Radicals #13: Pick the target, freeze it, personalize it, and polarize it. For Saul Alinsky’s final rule, he leaves his readers with some very practical advice on how to approach a grassroots campaign targeting policymakers or bureaucrats. Let’s break it down step by step. For principled activists, this means correctly identifying which politician or bureaucrat need pressure or accountability. Maybe they’re a lawmaker you think might be persuadable. Maybe they’re a bureaucrat responsible for wasteful spending in your county. While some movements may choose their targets based on political expediency, it’s important if you’re a principled movement to be sure the people you’re holding accountable are truly the ones responsible. This means more work up front, but it’s the right thing to do. It should be borne in mind that the target is always trying to shift responsibility to get out of being the target. There is a constant squirming and moving and strategy— purposeful, and malicious at times, other times just for straight self-survival—on the part of the designated target. The forces for change must keep this in mind and pin that target down securely. If an organization permits responsibility to be diffused and distributed in a number of areas, the attack becomes impossible. Don’t let your target deflect, diffuse or obfuscate. If a policymaker did something wrong, their constituents have a right to know and they need to be held accountable. If an elected official or political appointee makes a decision that’s bad for the people they’re supposed to be representing, they need to be held accountable. Blaming a particular political party, committee, department or caucus makes it easy for individual members to deflect and shift the blame. Again, this takes more work up front, but take the time to identify which people were advocating the bad policy or making the wrong decisions. Hold them accountable by name. Their constituents deserve to know the truth. When it comes to standing up for freedom and your fellow citizens, sometimes you need to draw a line in the sand. Too many elected officials and bureaucrats can be tempted to abandon their principles when the pressure is on or when they think no one is watching. On the most important issues, make it clear that there are only two sides—standing up for constituents or betraying them. There’s no middle ground. Like all the rules for radicals, it’s important to use this in a principled way. Too often in politics, people become so focused on beating the other side that they fall into using the same unscrupulous methods their opponents are using. But if you keep integrity as the foundation of your movement’s guiding principles, Alinsky’s tactics can be unstoppable. Want to learn more about Alinsky’s rules? Check out our Insight to Action program “A Night With Saul.” Find out if this exciting program is coming to a city near you and sign up for our email list here. Adapting Alinsky’s Rules for Radicals: Fighting for Freedom Should be Fun!